Investing.com – The U.S. dollar traded modestly higher Monday as the euro pared some of its gains despite expectations the European Central Bank at its meeting later this week will adopt a more hawkish stance on monetary policy tightening. The U.S. dollar index, which measures the greenback’s strength against a trade-weighted basket of six major currencies, rose by 0.02% to 93.57. 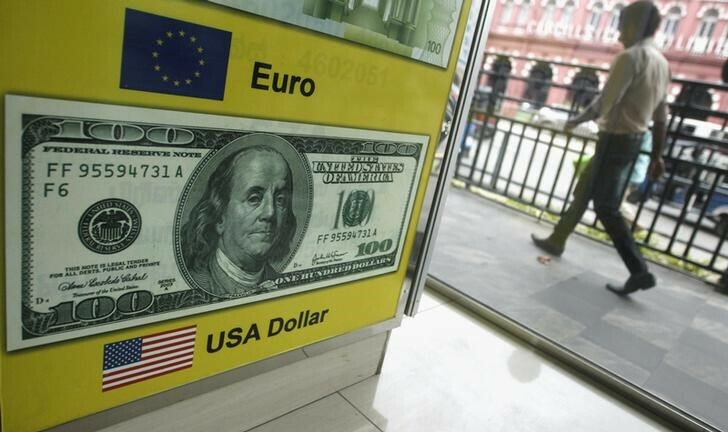 EUR/USD rose 0.11% to $1.1783 but remained well below its session high of $1.1783. “We are close to the next shift in ECB forward guidance to announce quantitative easing tapering: perhaps next week and no later than July, we think,” Morgan Stanley said in a note to clients. The dollar’s gains were also supported by a weakness in the Canadian dollar as investors fretted the escalating trade conflict between Canada and United States. USD/CAD rose 0.50% to C$1.2990. The subdued action in the dollar comes as market participants turned attention to the historic summit between U.S. President Trump and North Korean president Kim Jong un in Singapore. “The discussions between the United States and North Korea are ongoing and have moved more quickly than expected,” according to a White House press release. GBP/USD, meanwhile, fell 0.21% to $1.3379 ahead of a Brexit Withdrawal Bill vote slated for Tuesday and Wednesday. USD/JPY rose 0.44% to Y110.03 as risk-on sentiment reduced demand for safe-haven yen.